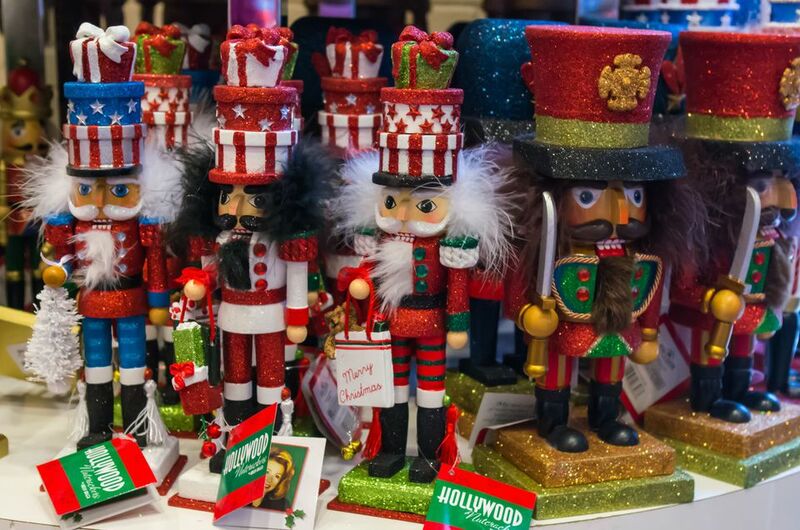 Holiday Markets in Washington, D.C.
Holiday Shops Presented by the Junior League of Washington - November 16-18, 2018. Docks at Union Market, 1309 Fifth Street NE, Washington, D.C. Annual holiday shopping event sponsored by the Junior League of Washington. More than 40 vendors gather at one spot to offer a variety of gift items while raising money for grants and volunteer efforts for local organizations. Downtown DC Holiday Market - November 23-December 23, 2018. Sidewalk on F Street between 7th and 9th in front of the National Portrait Gallery. Hours are noon-8 p.m. Enjoy a unique seasonal shopping marketplace in the Penn Quarter neighborhood of downtown Washington, D.C. Find gift items by more than 180 exhibitors and artisans including fine art, crafts, jewelry, pottery, photography, clothing, prepared food and more. A wide range of live, local musicians and bands will entertain shoppers. Jazz, swing, blues, reggae, bluegrass, klezmer, a cappella, brass and more create a fun, energetic atmosphere. Heurich House Museum Christkindlmarkt - November 30 - December 2, 2018. 1307 New Hampshire Avenue NW Washington, D.C. Shop locally made goods from over 40 vendors at the outdoor holiday market and tour the seasonally decorated home of German brewer Christian Heurich. This is Dupont Circle's only holiday market and includes gift items such as jewelry, ceramics, chocolate, housewares, clothing and more. Seasonal refreshments available for purchase in the Castle Garden. Swedish Christmas Bazaar - December 1, 2018, 11 a.m-5 p.m. House of Sweden, 2900 K Street, NW, Washington, D.C. Located at the Georgetown waterfront. The annual event is sponsored by the Swedish Women's Educational Association and supported by the Embassy of Sweden. The bazaar will feature Swedish arts & crafts; crystal, textiles, artwork, books, decorations, and much more. Enjoy Swedish Christmas carols performed by the Santa Lucia Procession. The Café will offer home baked goods and Swedish sandwiches. Free admission. Montgomery Village Holiday Craft Bazaar - November 17, 2018. Lake Marion Community Center, 8821 East Village Avenue, Montgomery Village, MD. (301) 948-0110. Hours are 9 a.m. - 3 p.m. This annual event will host over 50 vendors from the Maryland area, featuring all handmade crafts including, holiday decorations, jewelry, clothing, glass, quilts and more. Admission is FREE. Maryland Christmas Show at the Frederick Fairgrounds - November 16-18, and November 23-25, 2018. 797 E Patrick St., Frederick, MD (301) 898-5466. Hours are Friday/Saturday 10 a.m.–6 p.m., Sunday 10 a.m.–5 p.m. Enjoy the works of 500 artists and craftsmen offering fine art, pottery, furniture, quilts, jewelry, clothing, wreaths and garlands, toys and Christmas ornaments. Admission: Adults: $8.00, Children (12 and under): $4.00, Parking: $2.00. Sugarloaf Craft Festivals - November 16-18, 2018. Montgomery County Fairgrounds, 16 Chestnut Street, Gaithersburg, MD. Hours are Friday and Saturday 10 a.m.–6 p.m., Saturday 10 a.m.–5 p.m. Enjoy the crafts of 500 artists, including jewelry, wood, leather, clothing, sculpture, glass and more. Watch live entertainment and feast on a variety of foods. Admission: $10.00/adult, $8 if you purchase online, children 12 and under are free. Glen Echo Park Holiday Art Show & Sale - November 17, 2018-December 30, 2018. Popcorn Gallery at Glen Echo Park, 7300 MacArthur Boulevard, Glen Echo, MD. Thursdays & Fridays, 10 a.m. to 2 p.m. Saturdays and Sundays from 11 a.m. to 6 p.m. Friday, November 23, 10 a.m. to 4 p.m. Winter's Eve, December 8, 11 a.m. to 8 p.m. The exhibition will feature works by resident artists and will include glass, ceramics, photography, painting, and more. First Sunday Arts Festival Holiday Edition - December 2, 2018. Open 11-4 p.m. Historic West Street, Annapolis, MD. The free arts and craft show features about 100 local and regional artists, plus live music, dance, street performers, food and more. There will also be a special Chocolate Binge Festival to celebrate December. West Street will be closed to vehicular traffic. Kris Kringle Christmas Market - December 7-9, 2018. Charles County Fairgrounds, 8440 Fairgrounds Road, La Plata, MD (301) 932-1234. Modeled after the famous markets in Germany, this two-day event offers lights, holiday food, crafts, shopping, music, and more. Open Friday, 4-8 p.m.; Saturday, 9 a.m.-8 p.m.; and Sunday, 10 a.m-3:00 p.m. Admission: $1 or one non-perishable food item to benefit The Southern Maryland Food Bank. Northern Virginia Christmas Market - November 9-11, 2018. Dulles Expo Center, 4368 Chantilly Shopping center, Chantilly, VA. (757) 417-7771. Hours are Friday, Saturday 10 a.m.-6 p.m., Sunday 10 a.m.-5 p.m. This arts and crafts market features Christmas collectibles and thousands of home decorating ideas for the holidays. Admission $8/adult, children 12 and under are free. Fairfax Holiday Craft Show - November 17-18, 2018. Fairfax High School, 3501 Rebel Run, Fairfax, VA. Hours are Saturday, 10 a.m.-5 p.m. and Sunday 10 a.m.-3 p.m. Admission: $5, children under 18 are free. Enjoy handmade crafts including baskets, dolls, floral items, jewelry, paintings, photographs, pottery, clay, wood items and more. Vienna Arts & Crafts Show - November 23-25, 2018. Cherry Community Center, 120 Cherry Street, Vienna, VA. Friday and Saturday, 10 a.m.-5 p.m., Sunday, 11 a.m.-4 p.m. This show features more than 80 juried artisans offering original, handmade arts and crafts, including decorative painting, fused, etched, painted and stained glass, ceramics and pottery, hand-painted silk, woodworking handweaving, photography, and more. Holiday Market at Del Ray Artisans - November 30-December 16, 2018. 2704 Mount Vernon Avenue, Alexandria, VA. (703) 501-1736. Open Weekends. Hours are Friday, 6-9 p.m., Saturday and Sunday, 11 a.m.-6 p.m. The Market offers unique handmade fine arts and crafts from 20 exhibitors including pottery/ceramics, photography, jewelry, cloth, paper crafts, and glass, beautiful poinsettias from West Landscapes LLC, and delicious Bake Sale items to benefit the local community. Leesburg Holiday Fine Arts and Craft Show - December 1-2, 2018. Ida Lee Park Recreation Center, 60 Ida Lee Dr. NW, Leesburg, VA. The show features over 95 local and regional artisans selling hand made items from candles, stained glass, carved wood, jewelry, leather products, table linens, and much more. Hours are Saturday 9 a.m.-4 p.m. and Sunday 10 a.m.-4 p.m.
Wakefield Park Holiday Art and Craft Show - December 1-2, 2018. 8100 Braddock Road, Annandale, VA. (703) 321-7081. Hours are Saturday 9 a.m.-4 p.m. and Sunday 10 a.m.-3:30 p.m. This arts and crafts show features handmade arts and crafts nearly 60 of the area's finest artisans. Herndon Holiday Arts and Crafts Show - December 2, 2018. Herndon Community Center, 814 Ferndale Ave., Herndon, VA. Hours are 10 a.m.-4 p.m. A variety of handcrafted items and fine art will be on sale including wreaths, quilts, jewelry, Christmas ornaments, decorations, original artwork, photography, stained glass, and more. Sugarloaf Craft Festivals - December 7-9, 2018. Dulles Expo Center, Chantilly, VA. Hours are Friday and Saturday 10 a.m.–6 p.m., Saturday 10 a.m.–5 p.m. Enjoy the crafts of 500 artists, including jewelry, wood, leather, clothing, sculpture, glass and more. Watch live entertainment and feast on a variety of foods. Admission: $10.00/adult, $8 if you purchase online, children 12 and under are free. The Best Home Decorating and Garden Shows in Washington D.C.